Luis Felipe Campesato is a cancer immunologist engaged in finding novel therapeutic strategies for cancer patients. He is particularly interested in identifying mechanisms acquired by tumour cells to evade from the immune system and developing strategies to overcome them. 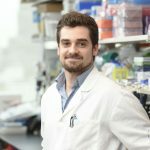 He did his PhD at the University of São Paulo, Brazil, and is currently working as a Research Fellow in Jedd D. Wolchok's Swim Across America Laboratory in the Memorial Sloan Kettering Cancer Center (MSKCC), New York.